Today 'The Techno Maid' is getting it's first guest post from my younger sister, Gemma-Rose. Blurb: Lucien is seriously ill but his life is transformed when an old Italian notebook gives him the power to become a stravagante, a time traveller with access to 16th century Italy. He wakes up in Bellezza (Venice) during carnival time and meets Arianna, a girl his own age who is disguised as a boy in the hope of being selected as one of the Duchessa's mandoliers. Arianna gives Lucien her boy's clothing and he is selected as a mandolier himself, becoming a friend of fellow-stravagante Rodolfo, the Duchessa's lover, and saving the Duchessa's life when she is threatened by an assassin hired by the powerful di Chimici family. For state occasions the Duchessa uses her maid Giuliana as a body-double but Guiliana commits the fatal mistake of revealing the secret to her fiance Enrico and a sequence of devastating consequences unravels. Meanwhile Lucien has met the original stravagante, the Elizabethan alchemist William Dethridge, and he begins to understand that he may be called to follow in his footsteps. 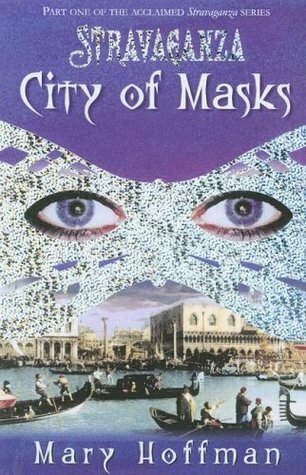 Thoughts: I really liked City of Masks. I loved how every girl above sixteen had to wear a mask, it was very mysterious and also gave a great opening for deception. I thought that Lucian was a rather good main character. In one world he had cancer and could hardly talk, but in the other he was perfectly healthy and trying to stop the evil di Chimici family. I also like the mystery that surrounded the Duchessa. Everybody loved her but did anyone know her? Nobody had even seen her face which was permanently covered with a mask. It was funny how Lucian’s master Roldofo thought that science was “magic” and obstinately called his magic “science”. I would definitely reread this book.